Check out the epic trailer for The Huntsman: Winter’s War! This is the promise given in the epic trailer for the sequel to 2012’s Snow White and the Huntsman. Entitled The Huntsman: Winter’s War, this upcoming film will expand the mythology of the first by introducing new characters and settings and going more in depth into the background of the Evil Queen. This new adventure will center not only around the Huntsman himself but also on the Warrior he loved and the powerful, vengeful queen they both served. Queen Ravenna has a younger sister called Freya whose powers allow her to turn anything and everything she chooses to into ice. After suffering a heartbreaking betrayal, Freya shuts herself away in an ice palace and starts training a legion of fighters to be her huntsmen and soldiers. Her most sacred command is for them to harden their hearts to love. But her two most skillful huntsmen, Eric and Sara, defy her orders and fall in love with each other. In her fury, she separates the two lovers. She also later learns that through the power of the Magic Mirror she can resurrect her older sister, Ravenna. She does so and they join forces and amass a vast and invincible army in order to begin a reign of terror all over the land. Fortunately, there is still hope in the form of the two banished huntsmen who, if they find a way back to each other, can defeat the two evil sisters and prevent them from waging a war that will destroy everything. This short trailer is full of amazing images: breathtaking scenery from snow-capped mountains to dense forests, the elaborate interiors of the ice palace, chilling scenes of winter frost spreading across the land and men turning into snow, and hardened soldiers training and getting ready for battle. 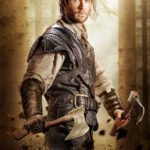 The Huntsman and the Warrior showcase their deadly skills with sword, axe, bow and arrow, and other weapons. The most striking images are of the four main characters, particularly the two queens. The Ice Queen’s voice is grave and cold and her stare is as piercing as one would imagine. There is also a magnificent sequence of Queen Ravenna materializing from molten gold as well as dissolving into golden ravens when attacked. The two queens also display their powers several times from Freya erecting a wall of ice between the two lovers and spreading frost all over the land, to Ravenna massacring a group of soldiers with inky, tentacle-like blades. Charlize Theron and Chris Hemsworth reprise their roles as the Evil Queen Ravenna and Eric, the Huntsman, respectively. 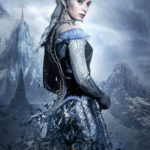 They are joined by Emily Blunt as Freya, the Ice Queen and Jessica Chastain as Sara, the Warrior. 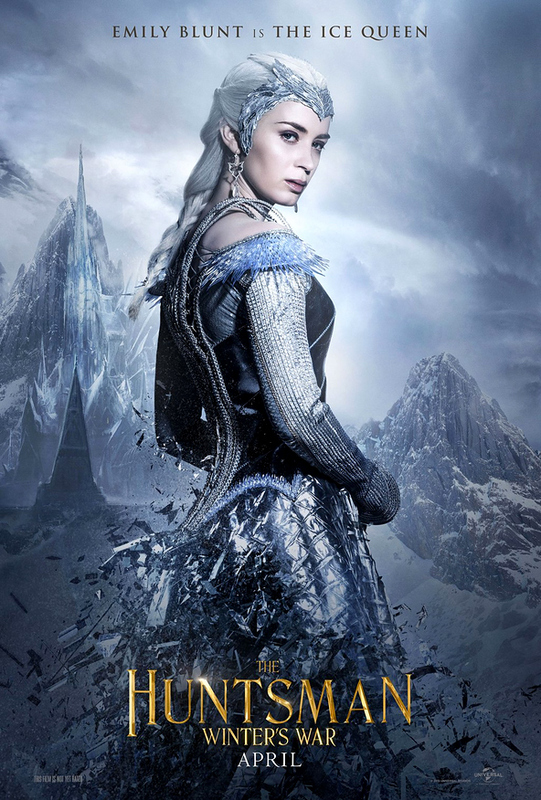 The Huntsman: Winter’s War is set to be released on April 22, 2016. Check out the trailer and a gallery of character posters for the movie below.